I admit a man can put a smile on my face. Yesterday that man was Dale Stetina. I was beyond thrilled when I noticed Dale Stetina at Mary's Market & Deli general store in the tiny town of Hygiene, Colorado yesterday. "It's all yours," Dale said as he was heading out of the bathroom and I was heading in. I hardly thought it the time and place to start gushing over someone, but my "Holy shi* that was Dale Stetina in a BMC jersey," response determined right then and there that I would say hello to this man I admire. Outside Dale stood under a shade tree chatting with his tandem bike pilot friend. I awkwardly eavesdropped, trying not to be too rude, until I found an opportunity to step up and say how wonderful it was to see Dale out riding. It was one of those situations that appeared like a sign - not to go all granola-Boulder on you - but truly Dale's words were inspiring. Dale is insightful and sharp, and quite honest about how his recent accident has changed his outlook on life. If anyone is looking for a motivational speaker - look to Dale Stetina. I know I would like to hear more of what he has to say. Purpose of life stuff aside, I was absolutely honored as Dale, now standing in the sun outside the general store, gave me a play by play race tactics replay of the previous day's Criterium du Dauphine Stage 7 in France. I love that stuff! I can't imagine a more perfect way to spend a Sunday morning than talking bike racing (with a very knowledgeable source) during a break from a bike ride in a beautiful place. The experience will be a long-cherished memory. It had been almost a year since I had ridden across the roads of Boulder County. I reasoned a trip to see a friend (Cycling Injures) in the hospital in Loveland in the early morning would be a perfect excuse to later park and ride from the nearby tiny town of Hygiene, Colorado. Years ago I rode these same roads maybe three times a week. It seemed like ages ago when I rode hard with groups and teams. I noticed something yesterday. I no longer ride in a team kit, I wear a bright friendly non-affiliated jersey and my Castelli shorts (which I will never go without). Clothing no longer needs to match perfectly and I have returned to riding my old titanium bike (the Cannondale Evo Supersix sits in the basement). The Ti bike is a fine bike, fixed up just right with Shimano Dura Ace triple, handbuilt Dura Ace wheels, Selle Italia saddle, and new ENVE fork. It is silver and black and simple with no power meter in sight. I am much less cool but I tell you - I get tons of smiles and hellos from cyclists out on the road. No matter the local opinion (and controversy) of who waves and who does not in Boulder. I discovered that it might just have far more to do with how you present yourself. What you give off might correlate with what you get back. 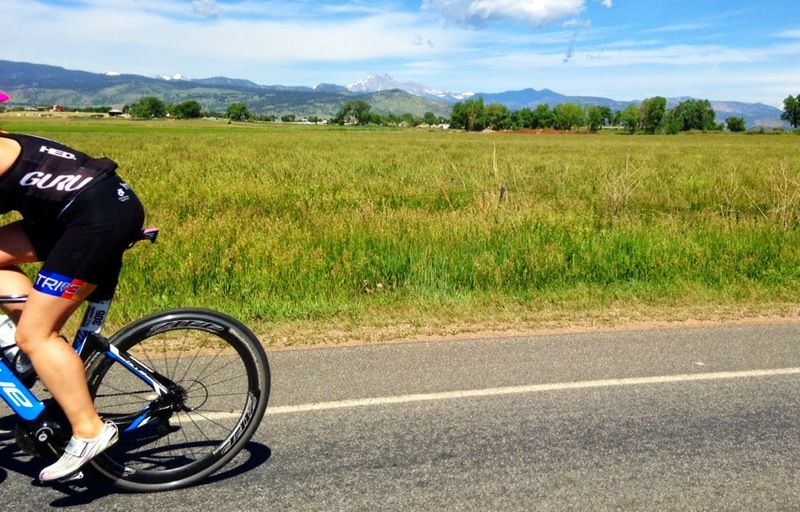 I figure by now, my chances are nil that someone will sign me to that pro team contract based upon my ability to seriously pass them quickly on a road in Boulder, Colorado. I have a far better chance of sharing a wave or a nod with someone whose instant impression of me might be - gee she looks like she is really enjoying her bike ride today. Indeed I was. I smiled for miles, inspired by a fine conversation and a ton of smiles received from fellow cyclists. Mary's Market & Deli in Hygiene, Colorado - a local gathering place and a fine place to talk cycling. Added inspiration by watching some of the triathletes in the 2014 Boulder Ironman race, witch took place on the roads near Hygiene yesterday. 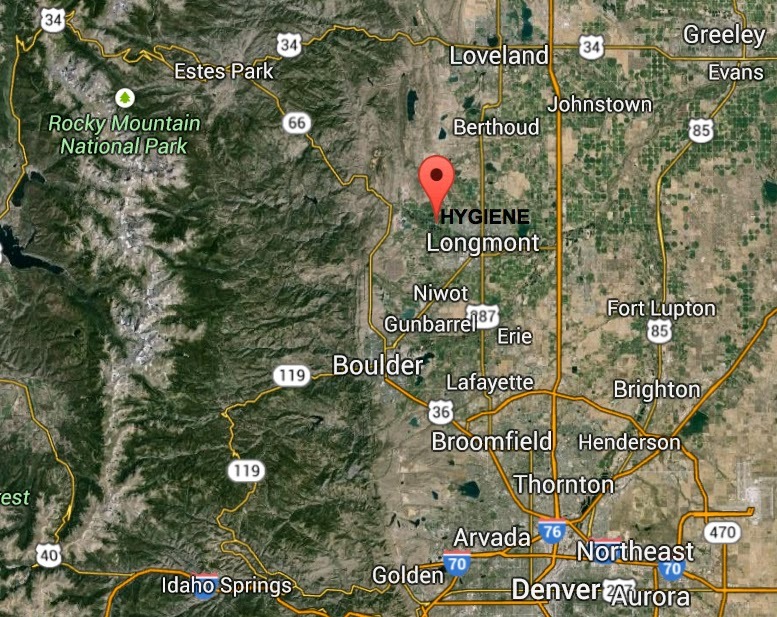 Location of Hygiene, Colorado, along the Front Range, north of Boulder and Denver. A recommended ride location.